How does the Industrial style look? "It’s all about the function, everything else is superfluous." 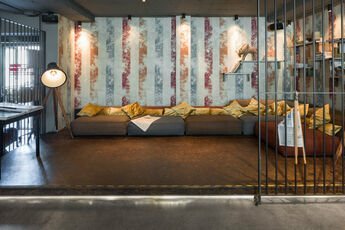 Industrial used to conjure up images of dirty production lines in abandoned factories, but today industrial is ultra-modern and stylish. Order and clear structures are determining factors in architecture and interior design. The significant features are reduction, clarity and plenty of space. The objective is to leave the room as open as possible, supported by high-quality furnishings. Usually, you will find this style in penthouses and old industrial buildings which have been converted into modern apartments. This style is dominated by reduced or cubic building forms, extreme aesthetic reduction, spacious rooms, wide areas, clean lines, and colours such as white or grey. Lots of glass, concrete, steel and natural stone are the preferred building materials. Large halls, old industry, bare concrete walls - this characterises the Industrial style. The trick is how to fill these empty spaces with life and allow them to shine with a new look. Hardly any other material is better suited to give rooms soul than wood. With mafi floors and the MAGIC and CORAL collections with their filled cracks, endless possibilities are offered here. The existing cracks in the wood are refinished by hand and harmonised. Thus, no two planks are the same and each floor is totally unique. The hand-work forms the bridge to the industrial style. The DOMINO Collection is also very popular with the small wood blocks out of Larch or Ash. This floor has a long tradition as a factory floor in Austria, ideally made for industrial properties which are transformed into living spaces.